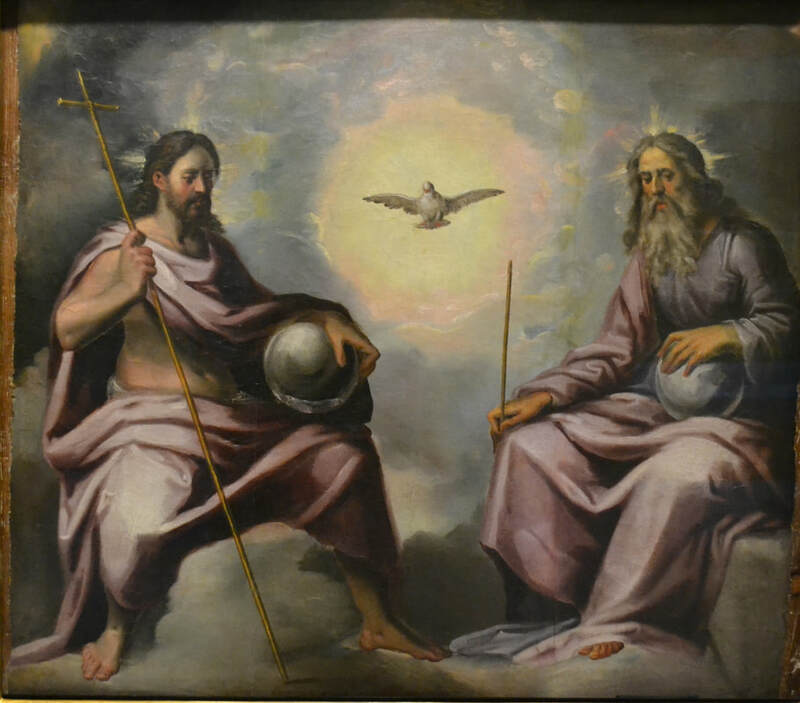 Holy Trinity by Vicente Requena el Joven (1556–1606). On the Pentecost we considered the coming of the Holy Spirit to the Holy Apostles. In our homily for Pentecost, the Holy Spirit, or Holy Ghost, is likened in Christianity and other religious Mysteries as the voice of God, the Holy Breath, or Holy Wind. The Holy Spirit is also represented by the principle of Fire. In the scriptures, the characteristic powers conferred by the Holy Spirit are the gifts of prophesy and healing. However, the Holy Spirit is not a rare theological visitor sent once, two thousand years ago, but an aspect of God that operates constantly in the macrocosm and microcosm. What is this aspect? In the theological context of the Trinity, the Father is the transcendent, ineffable aspect of God; the Son, or Logos (Word), is the immanent aspect of God, which is active and present in the world; and the Holy Spirit is the mediator between the two. The Holy Spirit is the principle of relation, consistent with Holy Spirit being synonymous with the communicating force of God (the voice, Holy Breath, or Holy Wind). In some sacraments, the communication of a word or name in a low breath intends to transmit the grace of the Holy Spirit. "The Ego cannot be recognized except in opposition to the non-ego. The assertion of the Ego is scarcely established, when we must instantly realize a reaction of the Ego, Absolute, upon itself, from which the conception of its existence will be drawn, by a kind of division of the Unity. This is the origin of duality, of the Binary… But the opposition of the Ego and the Non-ego immediately gives rise to another factor; this is the Affinityexisting between the Ego and this Non-Ego." If the Holy Spirit mediates or acts as an affinity between the ego and non-ego, what, then, is the result of its action? In Galatians 5:22-23, Paul describes the “fruit” of “walking in the Spirit” as love, joy, peace, longsuffering, gentleness, goodness, faith, meekness, and temperance. Galations 5:26 tells us, “Let us not be desirous of vain glory, provoking one another, envying one another.” In other words, to “walk in the [Holy] Spirit” means, in part, to rise above the baser instincts of the ego by way of an affinity to the noblest qualities of the higher self. "It is the divine discontent which distinguishes man from the lower orders of life. There is an instinctive and universal reaching out for something which is not yet realized. The longing is very evident, but its cause, significance and purpose are but dimly understood by the vast majority. If one can imagine an endless chain of peaks, each one back of the other, and each succeeding one more lofty, it may illustrate the law of progress. The present ambition will be fully satisfied by the ascent of the first and nearest. But that one accomplished, the ideal marches forward and always leads an advance. The desire to reach the summit of the second is even more compelling than in the first instance. It is the glory of man that he never makes or finds a final limit. At a certain point he discovers that there is no ultimate goal short of divinity. He must press onward and upward until he fully realizes his oneness and identity with his Great Source. But can this ever be realized? Is one ever to reach the summit and then sit down to rest? That was the old thought of heaven. But the new and far higher ideal is eternal progression. Forever? Yes, forever! That must be the purpose and meaning of the infinity which is inherent in man. This is the potential Christ which stirs within us." - The Most Reverend John Mongiovi (Tau Apollonius), Ep. Gn. Campbell, Joseph, and Moyers, Bill, The Power of Myth, ed. Betty Sue Flowers, New York: Doubleday, 1988. Smoley, R. (2002). Inner Christianity: A guide to the esoteric tradition. Boston, MA: Shambhala. Mille, A. (1992). Martha: The life and work of Martha Graham. New-York: Random Century. 264. Wood, Henry. The New Old Healing. Boston: Lothrop, Lee & Shepard Company, 1908: 152-157.